This is a rather long hike. 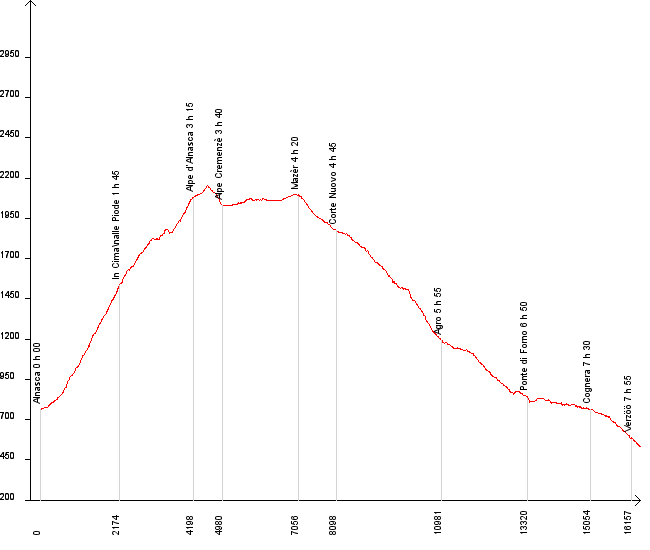 The scenery along the way is beautiful but without the 'wow' effect that you get on some of the other hikes, especially at the different passes (Passo Devo, Passo di Redorta, Passo del Lupo etc.). You start out in Alnasca (Brione) -- you need to cross the bridge and then the village and head towards the hills. Then there's a long way up through the forest. After around 2 hours and 900m higher you get out of the forest. The whole way up is done on a very steep hill right next to Brione so at this time you get very impressive views along Val d'Osura, Val Verzasca and Brione way below. After another hour or so you get to Alpe d'Alnasca where you can follow a trail up to the peak of Poncione d'Alnasca (which is about 150m higher). Note that this is not included in the total time. The next part of the hike goes through the high parts of Val d'Agro with beautiful and peaceful scenery. Then there's a very long way down, mostly through the forest. We found this hike easier to do starting in Alnasca (because of a very steep way up and then easy descent down to Lavertezzo) but if your legs don't mind going down through a very steep path you could consider starting in Lavertezzo, as you will get much more sun this way.